It’s a question all parents are going to hear at some stage. How can he deliver all those gifts to every child in the entire world in just one day? How does he know who has been naughty and who has been nice? 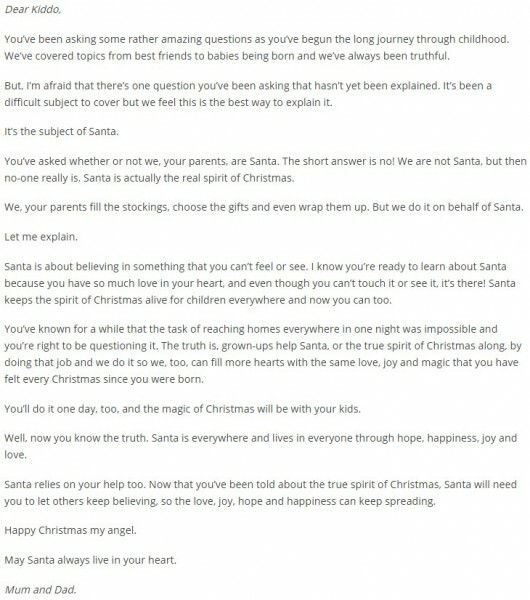 If your child ever starts to question Santa, please feel free to share these beautiful letters and explanations with them. 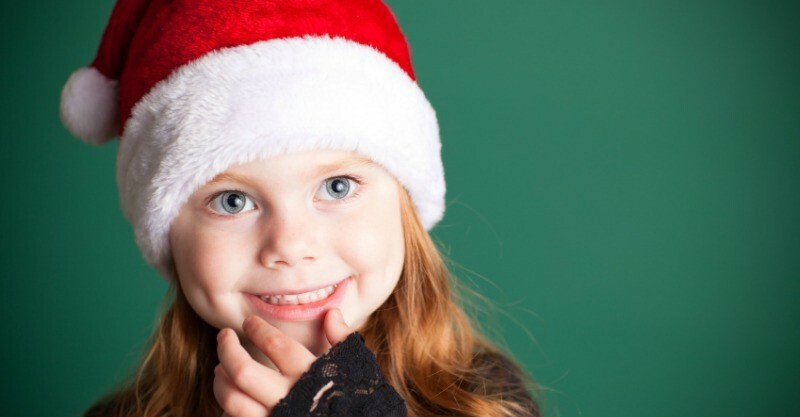 When Martha Brockenbrough’s nine-year-old daughter Lucy started questioning Santa’s existence, she wasn’t too sure what to say. So rather than say anything, she wrote a letter to Lucy, providing her with an eloquent explanation without shattering the magic of Christmas. This was over nine years ago and there have been countless Santa explanation letters floating around since. One of them comes from Jo Walsh who crafted her own explanation to your eight-year-old daughter. Thank you for your question about if Mummy and Daddy are Santa. It is a very good question. Mummy and Daddy and Santa all work very closely together throughout the year. Mummy and Daddy are the ones who see if you share with your sister and when you get upset and throw your toys. We are the ones that read your letter and watch as you circle the items in the catalogue that catch your eye. But, during Christmas time, we are more than just Mum and Dad. Santa is there too. Santa exists within every single mum and dad. One day, he may even exist inside you as well. Santa is so much more than the person who fills the stockings and who puts presents under the tree. Santa’s role extends to something beyond just the person who does this. Santa’s role is to show us that there is more to life than meets the eye – he teaches us that there is magic and hope. There are some things worth believing in and some things that we won’t completely understand but that doesn’t make them any less true or real. 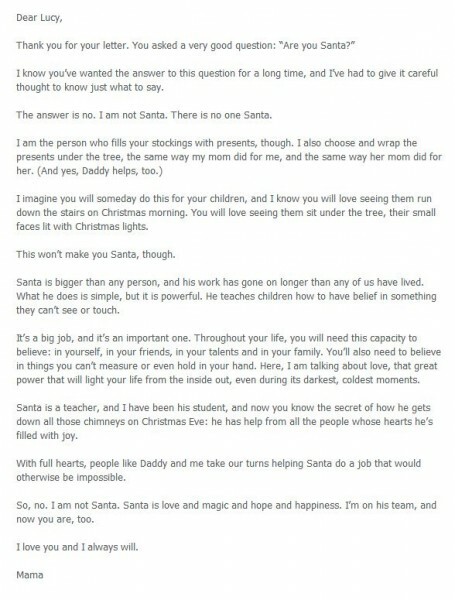 Santa’s role is bigger than any one person. Santa’s role extends to every single person in this world because it is through this belief in Santa that we learn to believe in other things – in ourselves, in our friends, in our abilities and in our world. If we don’t have the ability to believe in things we cannot fully understand or even see, then we lose hope. So, to answer your question, is Santa real? Yes, he is. He has been around for countless years and hopefully he will endure for countless more. He may not always wear red or come down the chimney but he will continue to symbolize hope, happiness, peace and, most importantly, he will continue to bring families together and to remind us all that there is goodness in the world. And you don’t always have to see it to believe it. When your children start asking questions about Santa it can be difficult to know what to say. You may want to be honest and open from the start or you may want to preserve the magic. Hopefully these letters give you some inspiration on what to say or what to write when the time comes to share Santa’s secret.